France beats England in rugby final! Is the Lerwill Cup win a sign of results to come?! 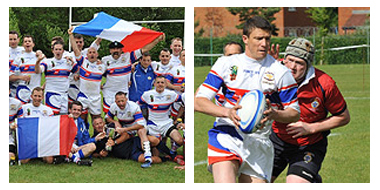 The French War College’s (Ecole de Guerre) rugby team proved that they were on the ball when they beat the UK Defence Academy at Shrivenham in England at the end of May. The team, sponsored by AGS Movers France, played 11 friendly matches sporting their AGS jerseys, before their final victory in the Lerwill Cup game against their British counterparts. Officiated by the Commander of the Defence Academy, the match was very tight but saw the French fifteen win on a score of 18-17. It is only the second time in fourteen matches that the French have managed to beat their British rivals. This is the second year AGS France has sponsored the team. Events like this give AGS the opportunity to partner with the French army socially in addition to providing professional services to the military. AGS also provides support to school rugby and football around the world as it realises that bridges can be built through sport. It acknowledges the important role that sport plays in enabling communities to come together.